In part 1, I relayed a story of the common carp. Long ago, the carp was domesticated by monks to have fewer, patchy scales, making the fish easier to prepare and eat. I thought that I was doing my best to stay on top of evolution-related news, but now I fear that I’ve grown lazy, and for that I blame Ed Yong. Yong is a tremendously talented writer who, I can only assume based on his output, has somehow genetically engineered himself to require no sleep. We highlight his work every week in What We’re Reading posts, and I have come to rely on him to tell me what’s happening in the world of evolution research. Evolution education, Humor, Misconception Monday, Well Said!/Say What? The New York Times published eight essays as part of its “Week of Misconceptions” series in early April. Yes, it’s true—we’re coming to the end of our month of trees here at Misconception Monday. This week brings three more misconceptions to tackle, including the one that needles me the most as a paleontologist. I’m saving that one for last. This week I am cutting to the chase! No long jargon-laden intros, no musings about jargon—now it’s all about the trees, baby! In fact, it’s all misconceptions about trees, and we’re going to tackle three of them. Last week I offered a long introduction to evolutionary trees, and I apologize that it was so long that we didn’t even get to the misconceptions. But as you realized, some common vocabulary is required if we’re going to make sense of evolutionary trees, and I felt that it was worth the time to get it all straight—even if we don’t all 100% agree on 100% of the terms (I’m looking at you, John Harshman!). This week, I again delay a bit to talk about the role of jargon in communication, but good news! I do manage to eek in our first tree misconception. Credit: UCMP Understanding Evolution (http://evolution.berkeley.edu) Evolutionary trees are everywhere—in textbooks, museums, trade books, and journals and magazines—and they are key to understanding common descent. And yet, to interpret them properly, you need to understand some specialized vocabulary and to adopt a specific mindset. Basically: It’s tough to talk tree. In Part 1, I told you about my work with the 1918 influenza virus, and promised to tell you more about why the Highly Pathogenic Avian Influenza H5N2 (HPAIH5) influenza strain that is currently rampaging through chicken farms in the Midwest is unlikely to jump to humans. 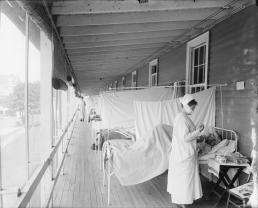 Back in the day, when Outdoor flu ward, 1918, Walter Reed Hospital I was the kind of scientist who worked in a lab, I spent seven years deciphering the genetic sequence of the 1918 influenza virus at the Armed Forces Institute of Pathology (AFIP) in Washington D.C. The pandemic caused by this virus, which erupted in three distinct waves beginning in the late summer of 1918 and ending in the spring of 1919, killed somewhere between 20 and 50 million people worldwide. Never before or since has an influenza virus killed so many, nor returned in so many waves so quickly. Could it happen again? 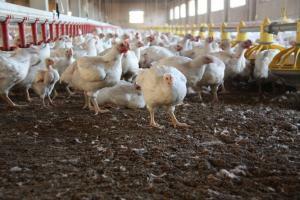 Could the outbreaks of avian influenza (subtype H5N2) currently devastating chicken farms in the Midwest lead to 1918-scale disaster? Misconception Monday: Is “Greenhouse” Misleading? “Greenhouse gases” and “the greenhouse effect” are terms used to describe some of the most basic concepts related to global warming. If students learn anything about climate change, they usually learn about these first. This is good in some ways, because these are the fundamental concepts in scientific explanations of how climate change works and why the earth is warming. But the specific metaphor here, comparing the Earth to a greenhouse with carbon dioxide and water vapor cast in the roles of panes of glass, has been criticized on the grounds that it may engender a misunderstanding of the science. Will Befriending Science Help Churches Grow?